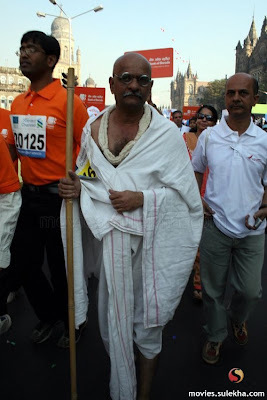 Some were running for peace, some for health and some for various NGOs. 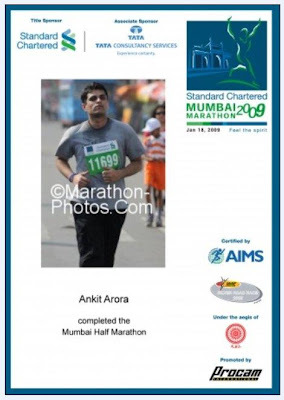 And so was I- running for peace, for health, for the undying attitude of Mumbai !! For me, it was needed a long run. After all, what can you expect from someone who is used to walking just 1-2 kms per day !! There is something that kept me moving till I reached the finish line. There were old people somewhere around their 70s who were ahead of me. There was support and cheer from crowd. There were thousands of volunteers who kept providing me water and ORS ( Oral rehydrastion solution) throughout my marathon. There were sweet little kids who were cheering 'Come on.. You can do it' and were offering biscuits and bananas..
Not only my own friends, but even I couldnt believe that I could complete the half marathon. The motivation to cross the finish line kept me moving throughout. What I learned from this marathon experience is that you can do much more than what you set for yourself. Initially I was targetting just 6-7 kms but challenging myself I ended up running 21 kms. What I witnessed was also awesome. There were numerous NGOs in dream run. Lots of celebrities. Roads were too clean. Standard chartered and TCS billboards everywhere. 7 km, 18 km and other markings on the way. Kenyans who went ahead of me like a breeze !! Words would not be enough for me to describe my experiences. You ll have to be there to experience it yourself !! For those who ran full marathon, I salute you ! It not only takes a lot of guts, but also perseverance and a lot of effort to keep one healthy after completing the full marathon. For those who are thinking of running next year, believe me it would be a great experience for you. But just keep in mind that you ll enjoy it more if you keep practising even 3-4 kms per day. So what are you waiting for ? 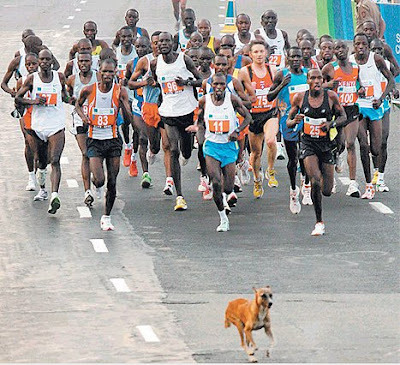 Get on your heels - Run Mumbai Run ! !